May 5th is best known as Cinco de Mayo, but it also happens to be National Mayonnaise Day (mayo...get it? ), a "holiday" that doesn't quite have the same notoriety as National Doughnut Day, National Chocolate Day, or any other of the bunch of food days that social media has taken to recognizing during the past decade or so. We do have a National Condiment Day, but in my opinion mayonnaise deserves some standalone love. Why? Well, because it's tasty, it elevates your sandwich eating experience to a whole new level, and it's something of a technological wonder in the food world. And, as if you couldn't tell, I love mayonnaise. Many people don't know this, but it's a condiment I could easily overdo and would put on a lot more foods if I wasn't concerned what people would think of me. I've heard that the Germans put mayo on their fries, which gets a big ja and thumbs up from me. 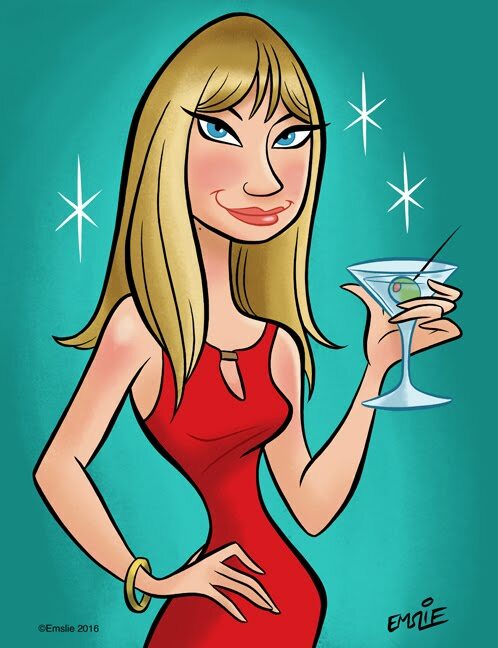 And when I read Fergie's (the princess, not the singer) autobiography that came out in the 1990s, I distinctly remember her confession that one of her favorite guilty pleasure foods before her Weight Watchers transformation was potato chip and mayonnaise sandwiches, a delicacy which I confess I have not tried myself, but I have dipped chips directly into a mayo jar so I'm sure that counts. In fact, mayonnaise is quite the vintage recipe, with origins dating back to the 18th century. According to the Hellmann's website, mayonnaise was invented by the Duke de Richelieu's chef in 1756 when his boss was busy defeating the Brits at Port Mahon in Spain. The chef was going to whip up a sauce of cream and eggs to add to a celebratory feast but upon realizing he was out of cream experimented with olive oil as a substitute. He called his recipe salsa mahonesa which evolved into the more French sounding mayonnaise. But not so fast; Wikipedia informs us that mayonnaise as a food name wasn't used until 1806 by Alexandre Viard, the author of a culinary encyclopedia. In that recipe version, aspic is used instead of an egg emulsion -- a deviation from the modern concoction we're used to. Some food historians theorize that mayonnaise grew out of the simplest form aioli, a combination of garlic and oil. Making mayonnaise from scratch is pretty straightforward; you add a bit of oil to egg yolks and whisk rapidly so that the combination emulsifies. Then adding lemon juice or vinegar is where the magic of food chemistry happens, with the acid helping to bind the mixture and turn it into the familiar creamy spread. Hellmann's, by the way, wasn't the first mass producer of commercial mayonnaise in the States. That honor goes to Amelia Schlorer, a Philadelphian who started selling her homemade recipe in glass jars in her family's grocery store in 1907. Schlorer's mayonnaise recipe was said to be the best among the community events and church functions she prepared food for. Hellmann's mayonnaise came along a few years after Schlorer's success. It was first sold in 1913 out of Richard Hellmann's New York deli. When its popularity began to take off he sold the deli and opened up a mayonnaise factory in 1915. Sales skyrocketed a few years later when the New York Tribune declared his brand of mayonnaise the best and noted its high concentration of oil. 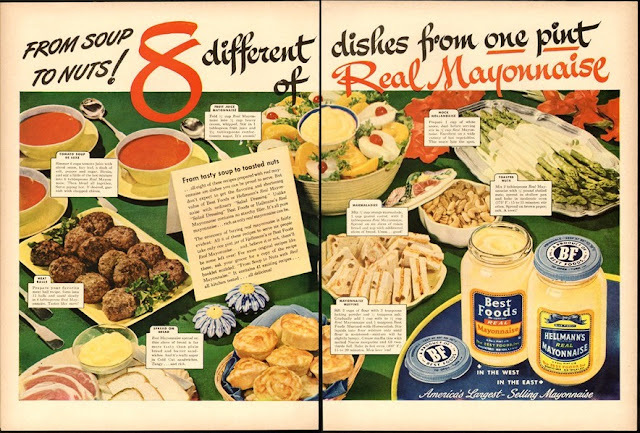 By the mid century it seems mayonnaise had taken off in popularity and was being used in everything from dips to fried chicken. (I've also seen, but have not tried, chocolate cake recipes that call for mayonnaise as one of the ingredients.) Mayonnaise is also much loved in other countries, with Europe, Japan, Russia, and Chili among the world's top mayo connoisseurs. Japan's most popular mayonnaise brand is Kewpie, featuring that iconic vintage doll (on the bottle, not in the mayonnaise, ha ha) and is made with apple and malt vinegars which I've heard gives it a different taste than American brands. Now...what to say of Miracle Whip? Do you love or loathe mayonnaise? Have you found a creative use for it in a recipe? Share your thoughts below and let me know! I LOOOOOOOVEEEEEE Mayo! Especially Hellmans. But since I've moved the go-to brand in Florida is Duke's. Which has more of a tangy snap. It's pretty good, but I never actually bought a full jar for myself yet. I use a light coating mayo, black pepper and grated parmesan (whipped together beforehand) as a base sometimes when I bread chicken cutlets, then bake them for 20-25 minutes and it comes out so delicious! That sounds good. I've also used mayonnaise instead of butter when making grilled cheese sandwiches in a skillet. You can't even really taste it, but it makes the bread just as crispy and lightly browned. Mayonnaise is a devil's brew, meant to put on bad food to make it even worse. There is no moral justification for it. I'm not against condiments in general, you understand. I partake in mustard, A-1, ketchup and even occasionally tarter sauce, when I'm in a wild mood, but I draw the line at mayo. What cruel God created this? I can't even buy a sandwich at the gas station. Don't mess with French cuisine!